the project you choose should not be too prescribed - you will do something different in your makerspace to what the children do at the "other end"
of course, it may be a little competitive too. 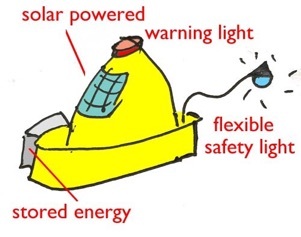 A better hat might have a solar energy panel, a storage battery, an adjstable light - for reading, or walking, a warning light perhaps coming on at dusk... but it could easily also have a rain triggered "widening" brim, inflatable horns (very Viking! ), a warm brim for cold nights, fly deflectors... and so much more. What is possible, and what choices, will depend on what components you send out - and you will need to send simple tools too - a soldering iron, solder - or maybe crimps... and so on. 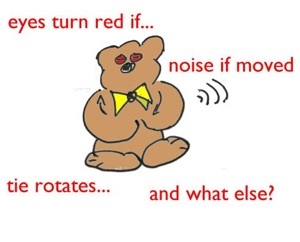 the bear might store heat energy for cold nights, or be a cleaning filter for poor drinking water - or could be programmed for sequential actions... and so on. 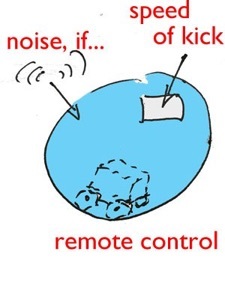 this idea can from one of the former-refugee students at UCJC - a ball that is so much more than "just a ball" - it could capture data (maybe an accelerometer), it could produce noises when kicked for sight impaired users (a bell? an electronic whistle?). A remote control (bluetooth? many of the refugees have smart phones, albeit the networks can be patchy as can electricity supplies), a little car inside (as inside a Sphero) could allow the ball to be remotely controlled - and programmed to score a goal on its own!... and so on.